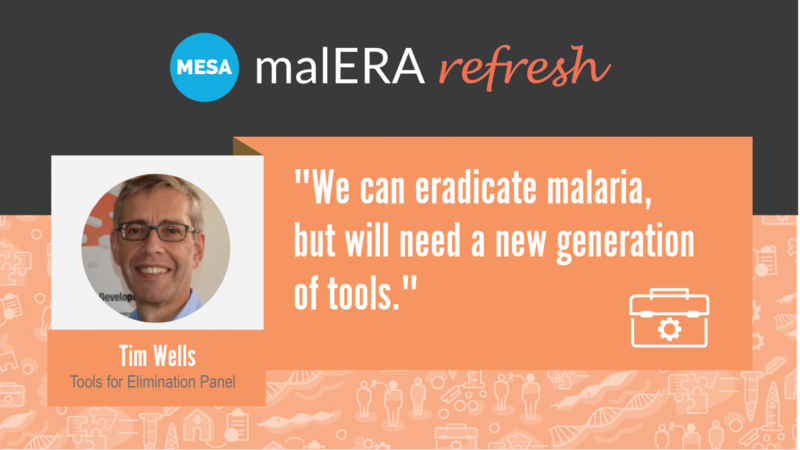 Today, PLOS Medicine has published the Malaria Eradication Research Agenda’s (malERA) update regarding diagnostics, drugs, vaccines, and vector control tools, and strategies needed for malaria elimination and eradication. This ‘refreshed’ approach allows for a greater understanding of the relationships between these research agendas. The paper, co-authored by Dr Timothy Wells, MMV’s Chief Scientific Officer, is the second edition of a paper written in 2011 and part of a series of six published in PLOS Medicine. Advances in recent years in malaria diagnostics, drugs, vaccines and vector control are making malaria elimination a real possibility. Yet, even with these new tools, the task remains a significant challenge in many settings. The paper considers the new interventions needed to make malaria elimination a possibility in all settings and highlights the advantages of the product development partnership model in meeting this challenge. For malaria medicines this means the development of new drugs for treatment and prevention that overcome resistance to existing drugs, regimens that simplify treatment such as a single-dose cure, new drugs to interrupt transmission and to stop malaria relapse, as well as new medicines that could be used during pregnancy. The research agenda is in line with WHO’s Global Technical Strategy for Malaria 2016–2030, as well as MMV’s 5-year Business Plan 2017-2021.